← evo has destroyed Bolivian Democracy! A ruling by Bolivia’s Constitutional Court allowing President Evo Morales to stand for a fourth consecutive term in office in 2019 has been described as a “blow to democracy” by his opponents. The court lifted constitutional limits on re-election arguing that they violated candidates’ human rights. 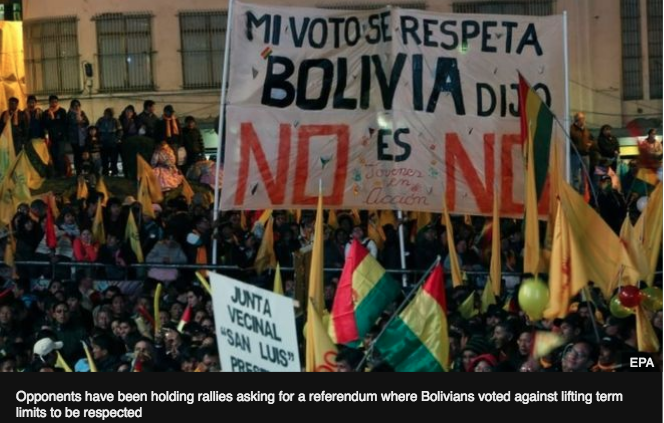 The ruling comes less than two years after Bolivians voted against lifting term limits in a referendum. The court was asked to rule on the matter by members of Mr Morales’ party. President Morales, 58, has been leading Bolivia since 2006. The ruling will allow him to stand for another term in 2019, and if he is elected, he would be in power until 2025. Former President Jorge Quiroga said Mr Morales was ignoring the will of the people as expressed in the referendum held on 21 February 2016. 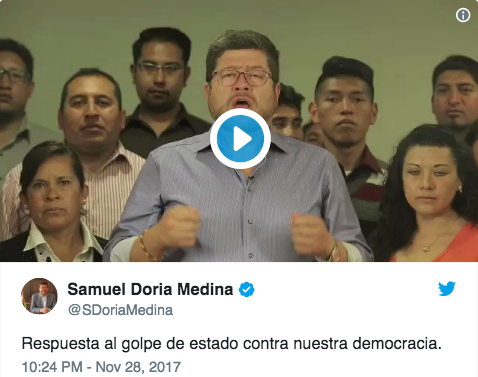 “The Constitutional Court has dealt a blow to democracy,” Mr Quiroga, who is from the opposition Christian Democratic Party, said. 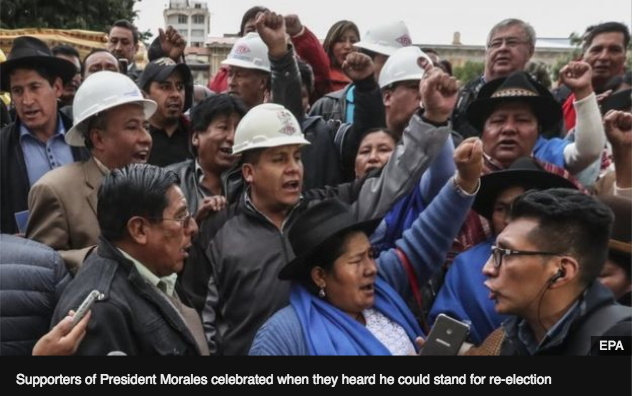 “Evo Morales is ignoring the constitution that he himself asked us to vote for,” he said referring to the 2009 constitution which was backed by President Morales. “With this ruling, they have now gone outside the legal framework,” Mr Doria said. The constitutional court argued that the human rights of Bolivian politicians to be elected and those of voters to cast their ballots for whoever they choose superseded the term limits set in the constitution. The ruling applies not only to the president but to all elected officials. “All people that were limited by the law and the constitution are hereby able to run for office, because it is up to the Bolivian people to decide,” the head of the court wrote in the ruling. The court quoted the American Convention of Human Rights as the legal framework for its decision. But the head of the Organization of American States, which is responsible for enforcing the convention, said the way the Bolivian court had interpreted the convention was wrong. He wrote on Twitter [in Spanish] that the article quoted by the constitutional court “does not envision the right to perpetual power”. Many of the people who voted “no” in the 2016 referendum said that after a decade of Mr Morales in power, they wanted to see someone else lead the country. But Mr Morales’ support remains strong among his traditional backers [Bolivian Thoughts opinion: these groups are just people who profit from giving that support; innumerable counts of corruption are spread throughout central government and municipalities where MAS acolytes are in power; some also give support out of blackmailing, for fear of losing their jobs, contras, influence and mostly out of fear for future trials on neglect and plain corruption] such as indigenous groups and some trade unions. They say that no other president has done as much to help the poor as Evo Morales has and they want him to be given more time to implement further social reforms. They also argue that the only reason President Morales lost the 2016 referendum was because of an illegal defamatory campaign launched against him in the run-up to the vote. Bolivian Thoughts opinion: I have never expected anything good from this individual. He came form the very vertical structure of the mining workers of Bolivia, which later served as the foundation to the strong coca growers’ union of the Chapare. A resentful individual, only brought over 60 people deaths on clashes with the police and his social movement groups who are basically his violent arm to silence the rest of the people. There are over 700 Bolivians who fled the country out of the relentless political persecution the mas, evo forces on to them. When he assumed power, he staged a sort of enthronization by the Tiawanacu ruins, to project his image to those ignorant voters. He portrays himself as the savior, the only solution. Even his VP said once, that the sun and moon will hide and there will be total darkness if evo abandons the presidency … In short, this individual is a demagogue, delusional egomaniac who will do anything to remain in power! This entry was posted in Bolivia, Politics, Social Unrest and tagged bad politics, cocaine production, corruption in public office, democracy in peril, government failures. Bookmark the permalink.